Hope everyone who celebrates Easter had a good one! We went to my brother’s, where there was plenty of good food, and good times with family. 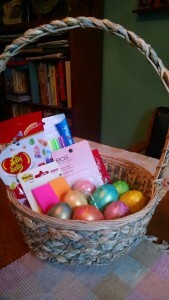 I also had put together a pretty Easter basket for my college kid, then forgot to take it to the gathering. D’oh! I think my brain’s still a bit fried from what I’ve been working on all week: making this site mobile-friendly. It took some doing, since this theme wasn’t originally intended for mobile, but I like this site’s look and wanted to keep it, so I got it done. So now you can pull it up on a phone or tablet, and won’t have to wait for all the big graphics to load, and there’s now a simplified menu just for mobile users that slides out from the side. If you try it out and see anything wonky, please let me know! I also have some exciting news: the cat story anthology I designed the cover for is now out! 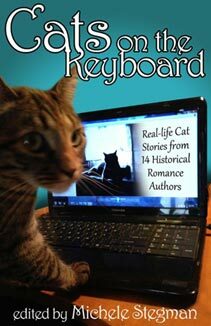 Cats on the Keyboard: Real Life Cat Stories by 14 Historical Romance Authors is a collection of true cat stories, written by cat-loving historical romance writers, and compiled and edited by one of my writing friends and editors, Michele Stegman. 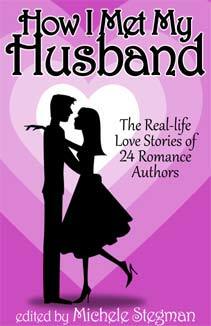 Enjoy the stories and take a look at the excerpts from each author’s book. 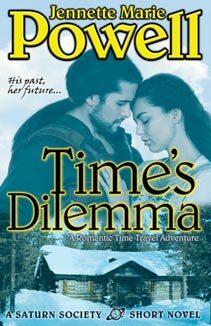 (I was included because I write historical time-travel.) 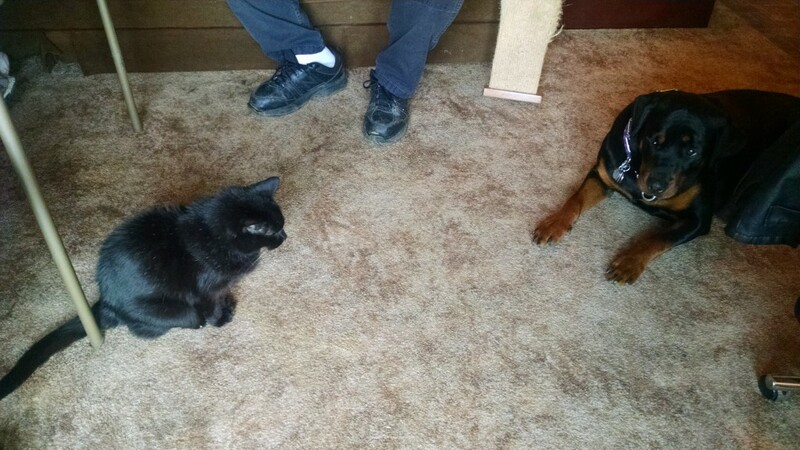 Since I don’t have a cat, my contribution to this one is how my parents ended up with their cat, Q.T. Pi. 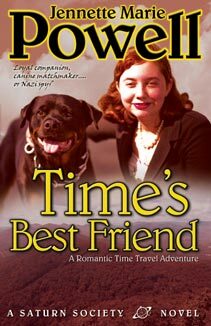 It also includes a sneak peek from my current WIP and upcoming release, Time’s Best Friend, which features a dog. Best of all, Cats on the Keyboard is free on BarnesandNoble.com and Smashwords.com. If you’d like to get it for free on Amazon, please visit its page, click “Tell us about a Lower Price,” and enter the Barnes & Noble link above, so they will lower the price to free. 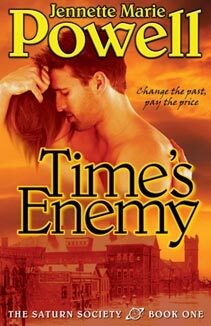 If you prefer to get your ebooks from iTunes or Kobo Books, it will be available at those retailers soon. If you gather from the above that I didn’t get much writing done, you’d be right. I decided to take the week off and just get the mobile website done. I did do some reading though. 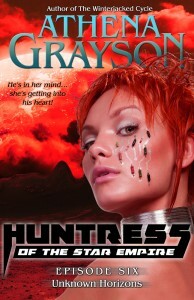 What I read this week: Huntress of the Star Empire, Episode 6 by Athena Grayson. Getting better and better! 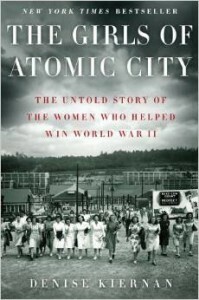 I also finished–pretty much–an interesting nonfiction book I started for research several weeks ago, The Girls of Atomic City by Denise Kiernan. The subtitle pretty much says it all: “The Untold Story of the Women who Helped Win World War II.” What I especially liked about it was that it focused on all the behind-the-scenes people who did all the un-glamorous jobs at Oak Ridge, but who all contributed to the cause. I especially liked it because I learned not only about who worked on “The Project” and what it was like, but also about the ordinary lives of ordinary people in an extraordinary time. My kind of thing! ROW80 Update: It’s time for Round 2, and a new set of goals! Well, mine aren’t really new, as I didn’t get as much done last Round as I’d hoped, so the major goal from Round 1 are pretty much being rebooted for this Round. 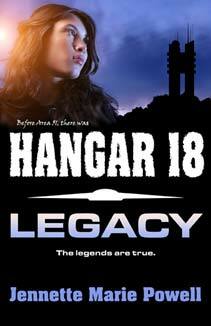 That would be to finish the WIP and revision, and get it to the beta readers. Ideally, it will be published by the end of Round 2, but since my saying it seems to have a way of making it not happen, we’ll just hope for the best. Also, publishing it is not fully in my control, as there are editors, my publisher, etc. I also spent a lot of time on the marketing workshop this past Round, so my other main goal for this round is to put what I learned into place. Getting the mobile-friendly website design implemented was the first step there. What about you–if you celebrate Easter, did you have a good one? Do you like pet stories? (If so, go get Cats on the Keyboard!) Got any pet stories of your own to share here in the comments? If you’re participating in ROW80, or even if you’re not, what are some of your goals for these next three months? Please tell us about it below–I’d love to hear from you! 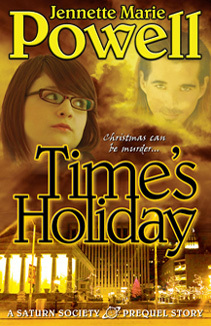 This entry was posted in Blog, Good Books, ROW80 and tagged author, Cats on the Keyboard, goals, Jennette Marie Powell, ROW80. We don’t really celebrate Easter, but I did cook (in a way). My son (who hates ham) couldn’t join us since he was on a plan to Phoenix, so I took that opportunity to serve ham to the rest of us. Yum! Re: pets. They do make for interesting stories, don’t they? It’s been years since we’ve last had a pet and some days I miss having one around. If it weren’t for our friend who is allergic, or the fact we like to travel a lot, we might have a dog or cat (we like both). I can’t imagine we’ll NEVER have a pet again, though. Stacy, sounds like you had a good Easter! And thanks for mentioning the comment issues–I think my anti-spam plugin once again got a little too aggressive in its latest update. FYI – I just downloaded the cat book from Amazon and it was free. I guess they price matched. Yay! I’m glad you had a nice Easter and that things got ironed out with the new mobile design or app or whatever. I hate technology so kudos to you for keeping at it. Yay!!! It took my comment! I think Cats on the Keyboard would make excellent bedtime stories for my cats. Glad there are multiple tales because my cats sleep a lot. P.S. By the time I went on to tell Amazon about the lower price, it was already set at free. “Cats on the Keyboard” is now at home on my Kindle. Thanks for telling us about it.